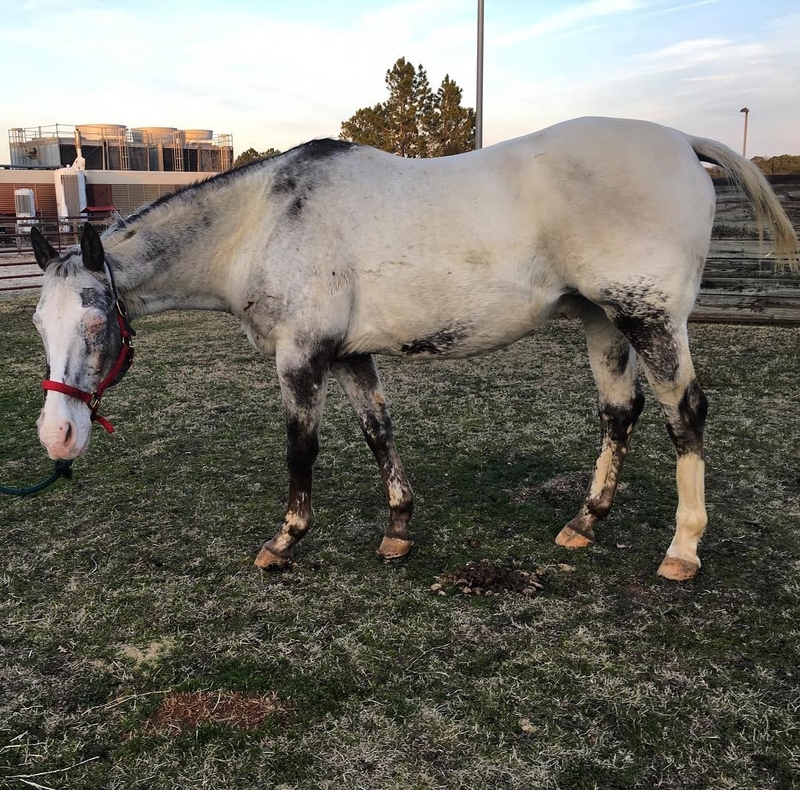 Cash is a 20 year old Waps breed Appaloosa gelding. 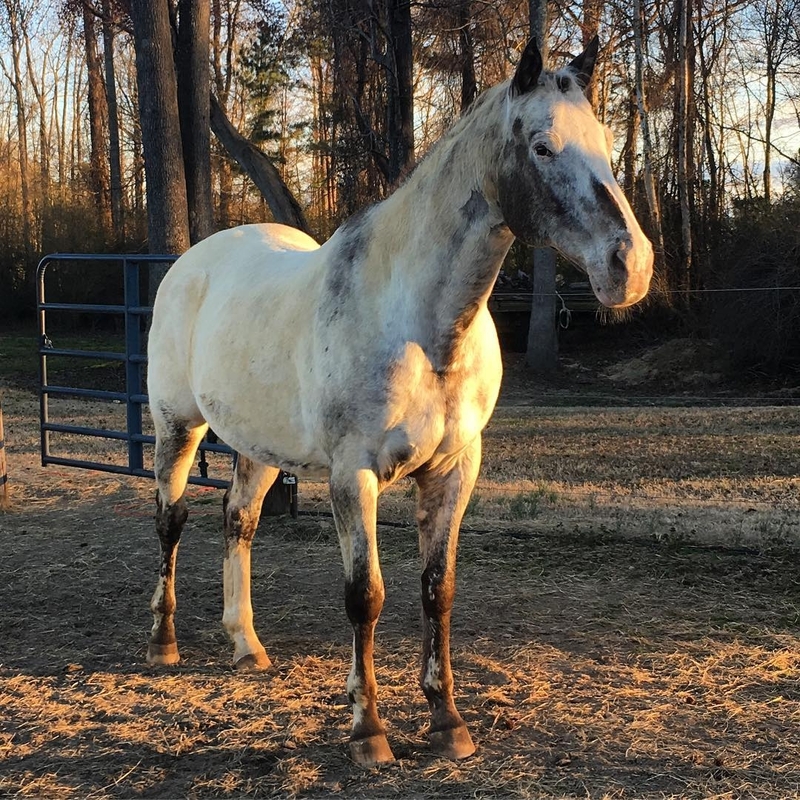 Sarah Storm purchased him in April 2017 as a trail horse for her husband. 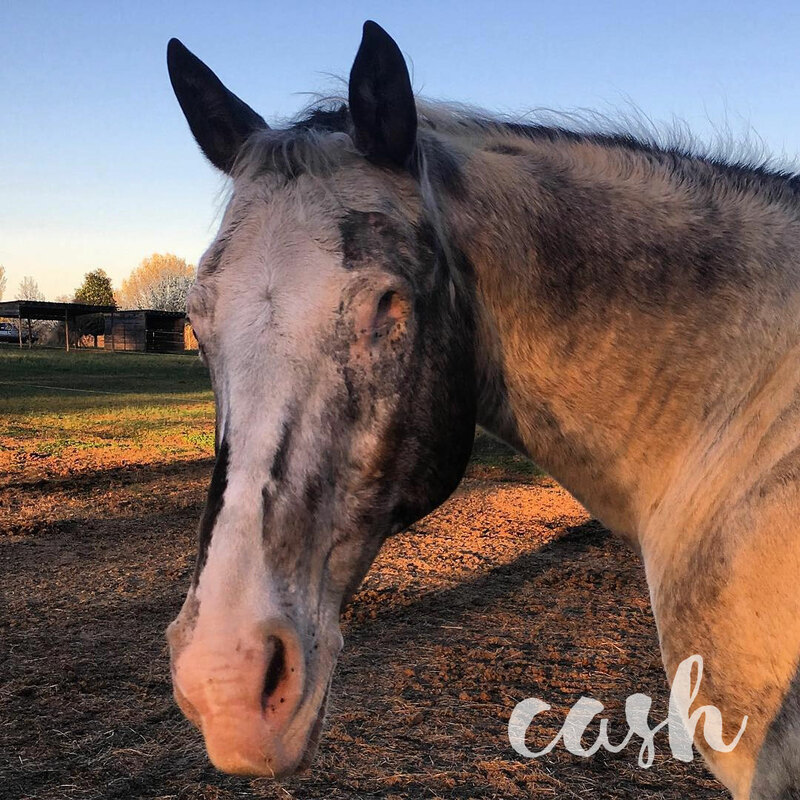 When Sarah first saw Cash, she knew right away that he had some existing eye problems. His left eye was continuously draining (lacrimation) and slightly cloudy. However, since he was everything else they were looking for, they decided to buy him anyway. 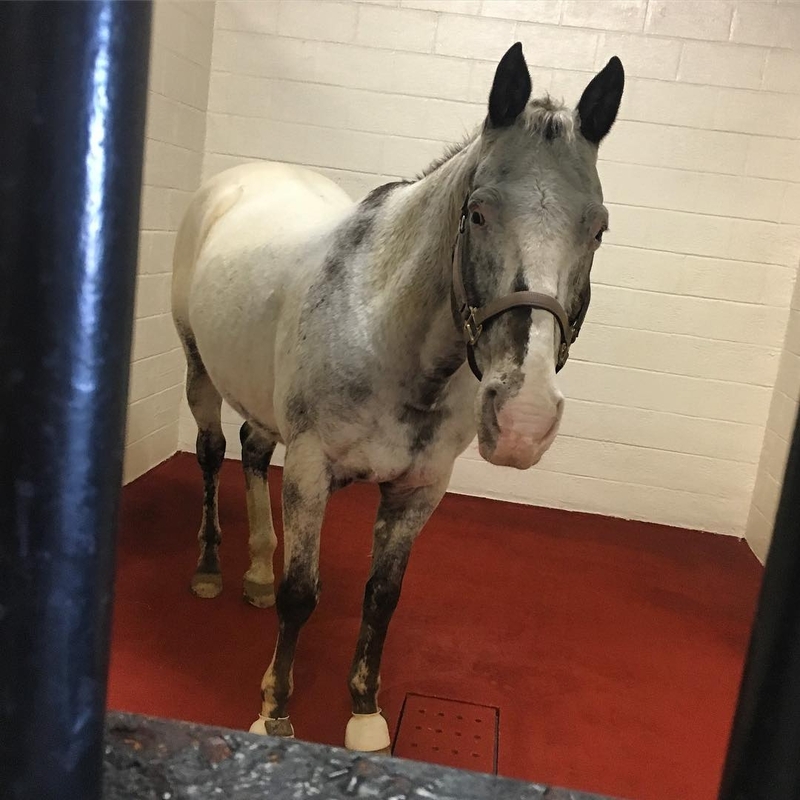 Shortly after Cash arrived at his new home, Sarah made an appointment with their primary veterinarian, Dr. Smith, who diagnosed him with uveitis. Cash was treated with topical neo-poly-dex 1-2 times a day and topical atropine once a week, for several months and responded favorably to the medication. However, things became tricky when the Storms’ decided to take some time away for a short vacation. Sarah was reluctant to ask her friend to fight with Cash every day to administer the medication in his eye. 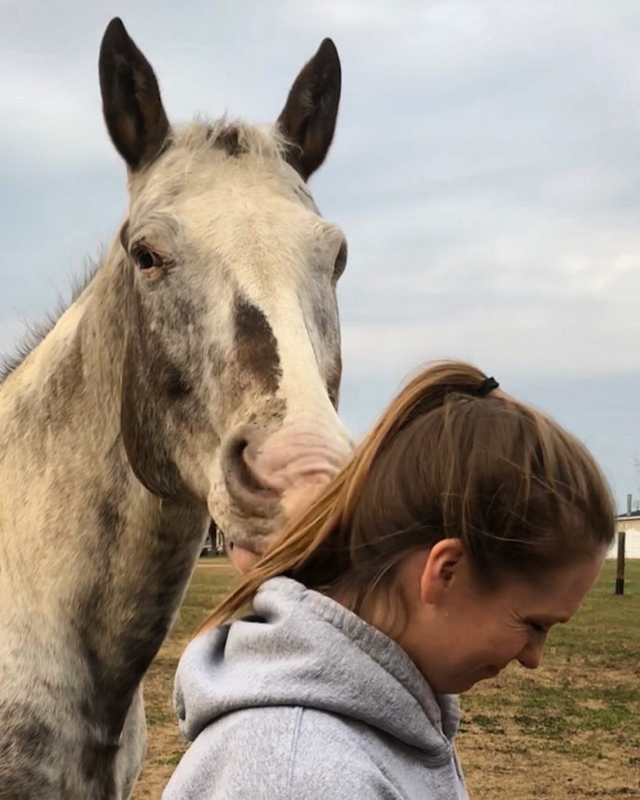 Therefore, Sarah decided to put Cash on a low dose of Equioxx once a day, which would be much easier for her friend to administer. When the Storms’ arrived back home from vacation, they noticed that Cash’s eye looked even better. 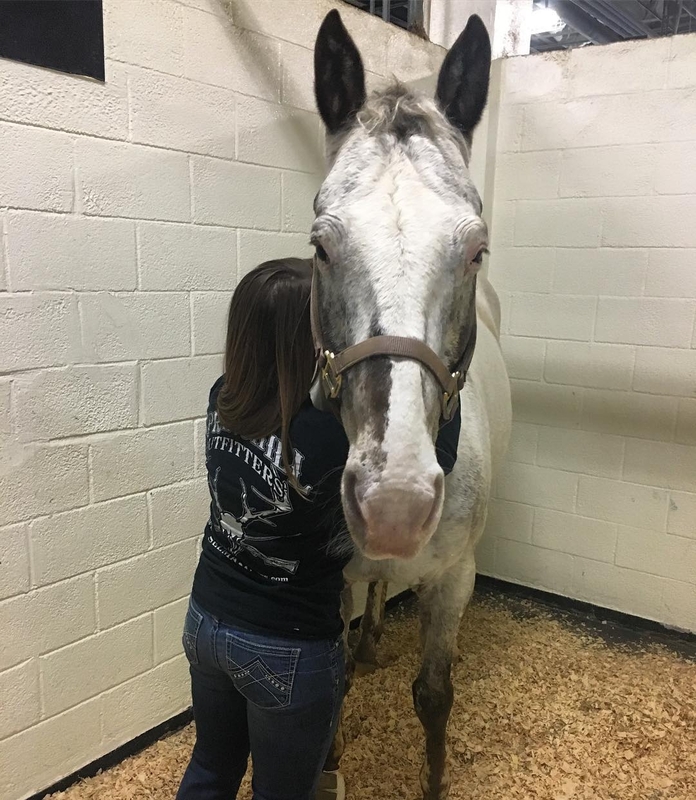 Sarah consulted with Dr. Smith about the changes in medication, and it was decided to keep Cash on the daily Equioxx and stop the topical medication. Six months later, it became clear that Cash was having trouble seeing. 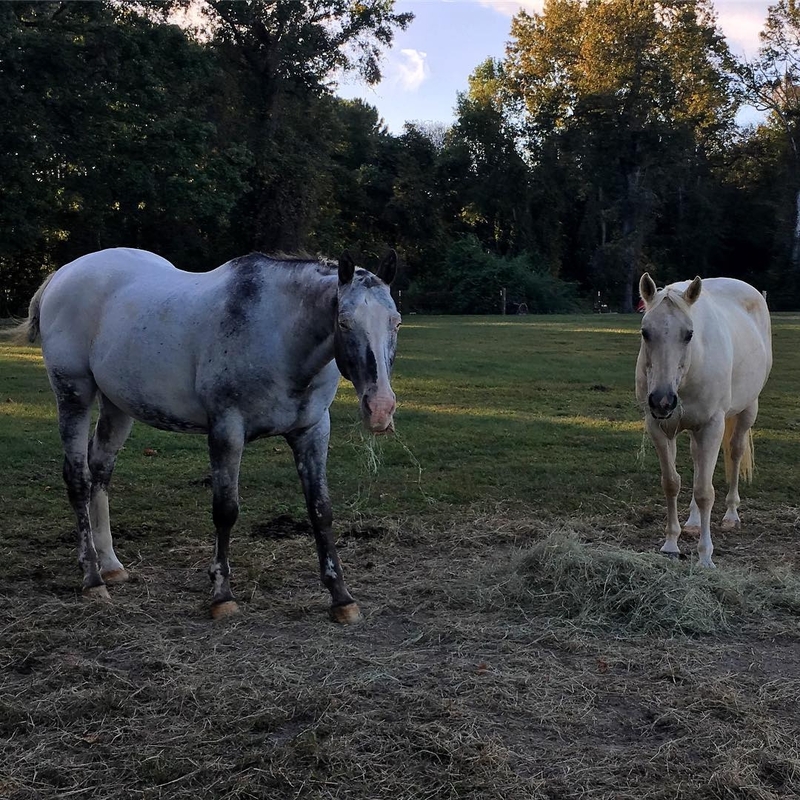 At night, Cash increasingly had more and more difficulty finding his hay (which was placed on the ground in his pasture). Cash was also seen bumping into solid objects. This went on for another two months, until it had progressed to the point where Cash began tilting his head in order to see. All of a sudden, Cash’s left eye began to flare up again. 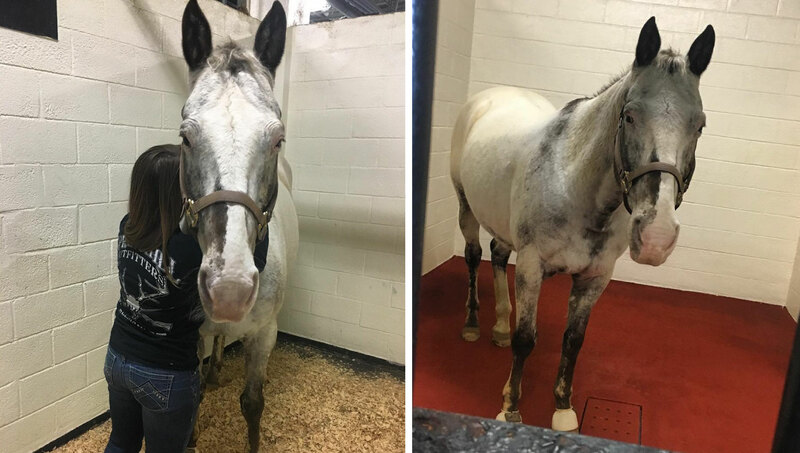 Sarah started Cash back up on the topical eye medications and Equinoxx, however this time nothing seemed to be helping. Dr. Smith referred Cash to North Carolina State University (NCSU) Veterinary Hospital. Upon arrival at NCSU, Sarah and her husband were promptly greeted and asked a series of questions related to Cash’s history. Cash was walked into a separate room where he received a full ophthalmic exam. The intraocular pressures were 11 and 15 mmHg in the right and left eye, respectively. He had no menace response, pupillary light reflexes, or dazzle reflexes in his left eye. 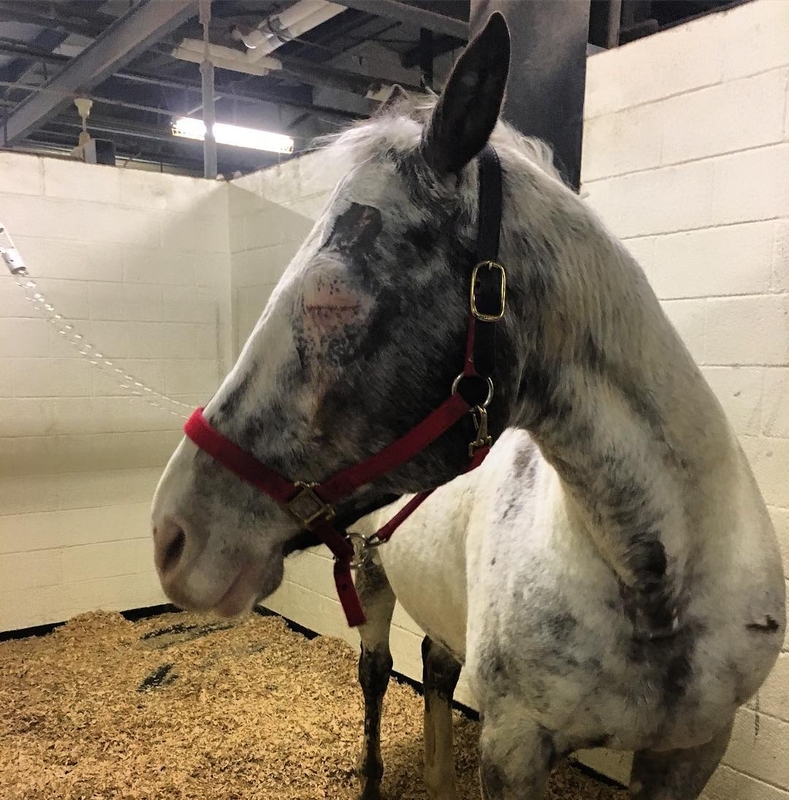 On direct examination, it was clear that Cash was permanently blind and had an infected stromal ulceration in his left eye as a result of chronic inflammation. His right eye showed evidence of posterior lens luxation, meaning that the lens had shifted out of its normal position and into the back of the eye. The shifting of the lens more than likely had caused some degree of vision loss in that eye as well. 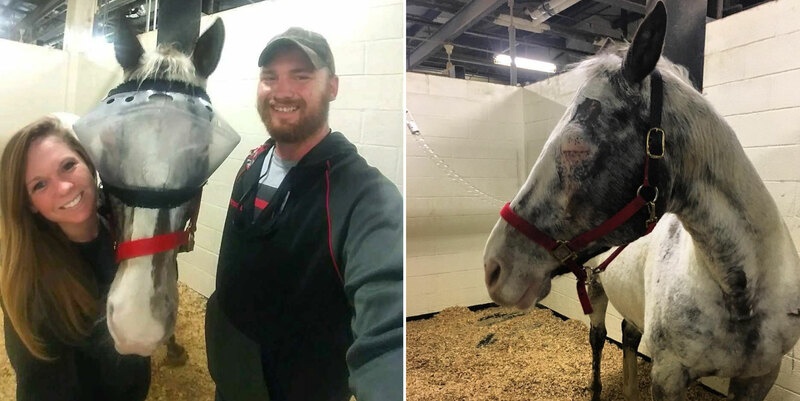 Cash was diagnosed with equine recurrent uveitis (ERU) in both eyes. 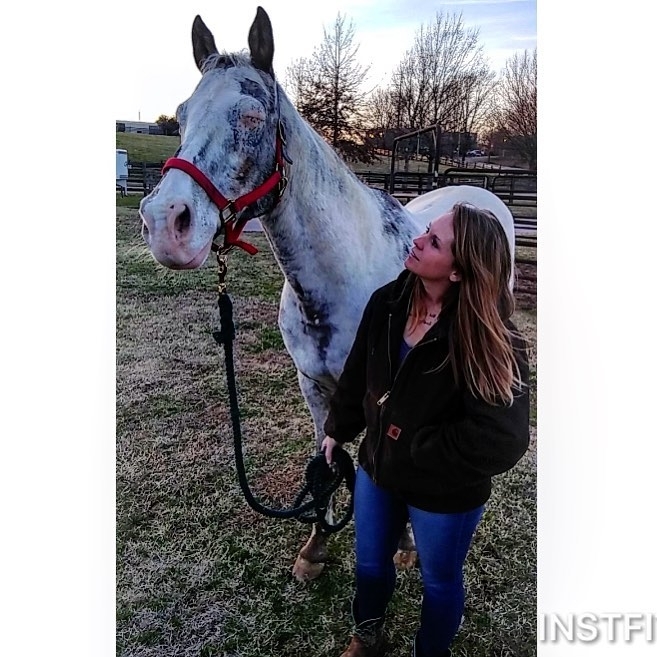 Being an Appaloosa, he was unfortunately predisposed to the disease, since the breed is 8.3 times more likely to develop uveitis (of any type) than all other breeds combined, and 4 times more likely to go blind as a result. 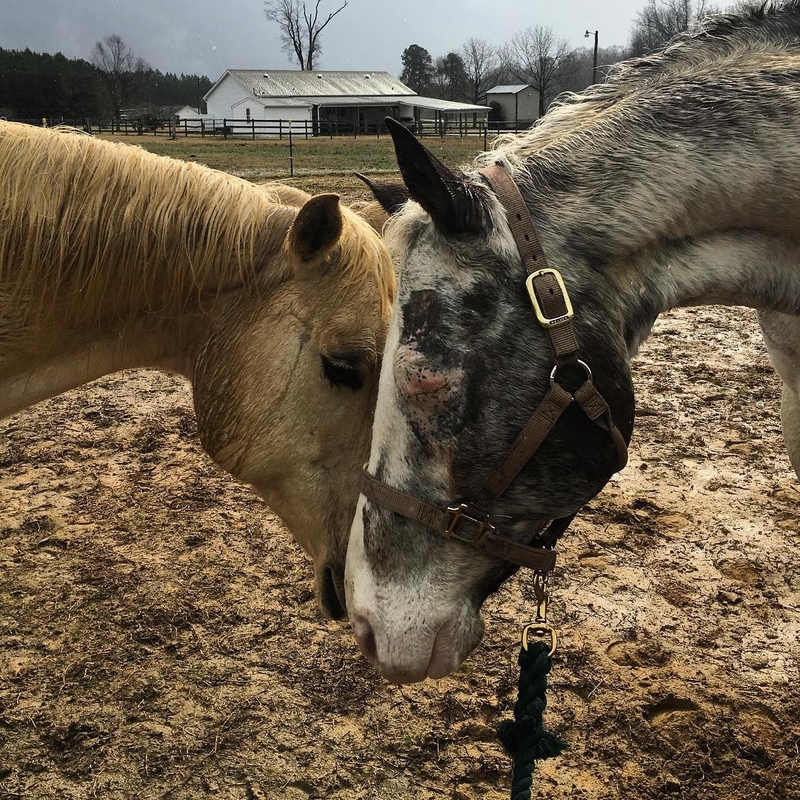 The doctor recommended enucleation (the removal) of Cash’s left eye, since he was already completely blind, and to eliminate it as a source of continuing problems and pain. Sarah was presented with a few treatment options to consider for Cash’s remaining (right) eye. Option One: Sustained release intravitreal cyclosporine implants – This treatment alternative involved the surgical placement of an implant into Cash’s eye. Over time, it would slowly release a medication called cyclosporine, which would help reduce the inflammation and uveitis flare ups. 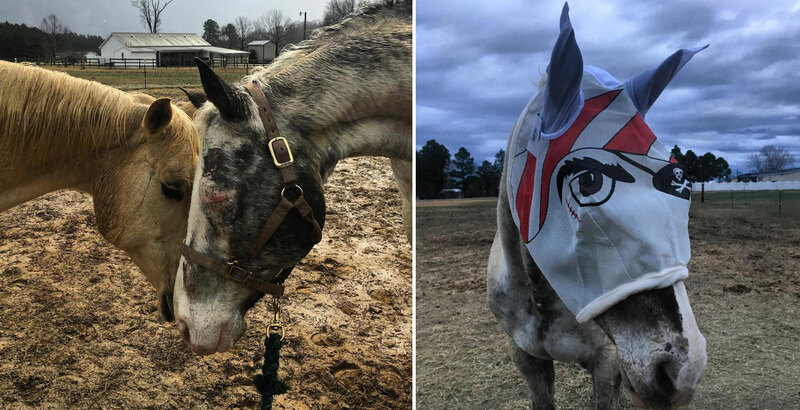 Option Two: Suprachoroidal Triamcinolone Injections – This treatment alternative consisted of administering a steroid (suprachoroidal triamcinolone) injection into Cash’s eye every 2 to 3 months. Once administered, it would help provide a more local control of the inflammation, with potential adjunctive topical and systemic therapy. Sarah decided to treat Cash’s right eye with suprachoroidal triamcinolone injections (option two). Cash stayed overnight at the hospital, and the next day his left eye was removed via standing sedation. During this time, he was also administered the suprachoroidal triamcinolone injection into his remaining (right) eye. Both procedures went smoothly without any complications. Cash remained in hospitalization at NCSU for several more days. During this time, he received flunixin meglumine (Banamine©) to help with the pain, omeprazole (Gastroguard©), and trimethoprim sulfa (TMS/SMZs) tablets (an antibiotic). 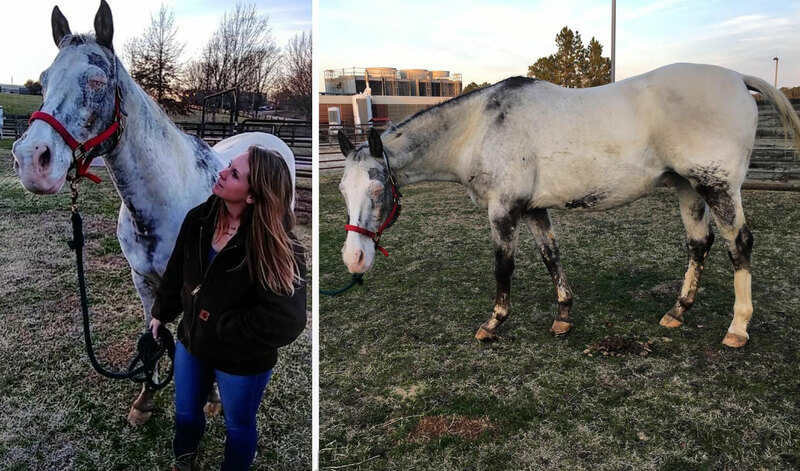 Cash was closely monitored by the veterinary team at NCSU and hand walked twice a day. Sarah and her husband regularly visited Cash during his stay at the hospital. 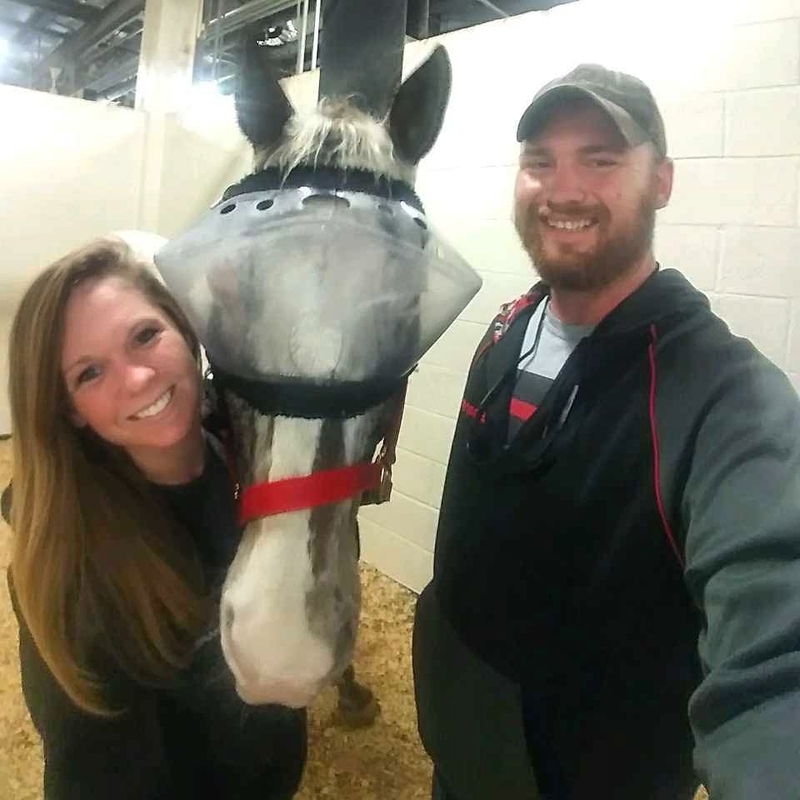 Upon discharge from NSCU, Sarah was advised to closely monitor Cash’s eye for any changes, especially for the presence of any discharge, squinting, cloudiness, or redness. 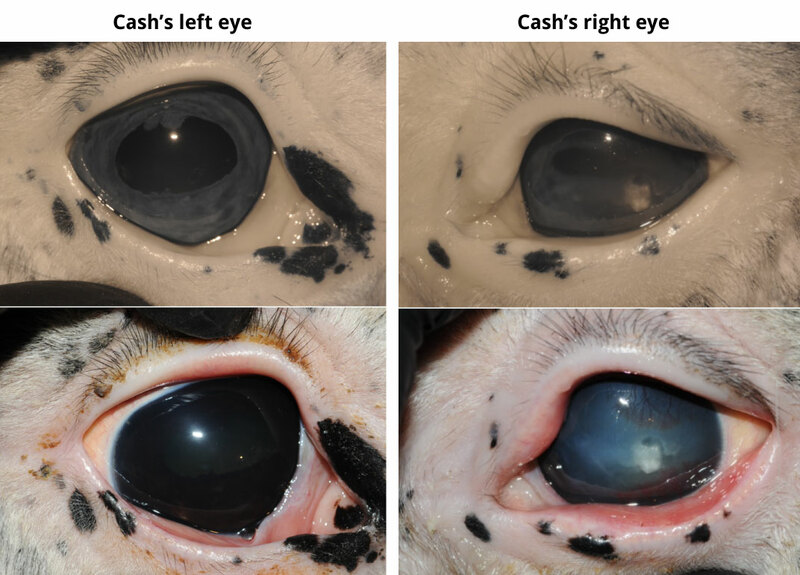 The main goals for treatment of Cash’s uveitis were to reduce discomfort and decrease inflammation in an effort to minimize the sequelae of uveitis, and to preserve vision in his remaining (right) eye. 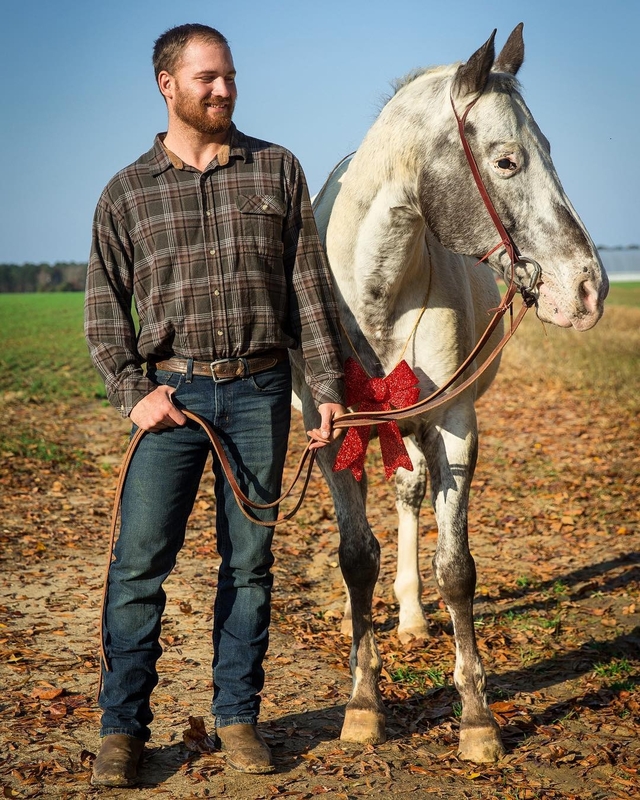 To decrease the risk of Cash running into objects and injuring himself while turned out in the pasture, Sarah made sure to cut down any tree branches that were potential in his path or that stuck out over fence lines. Any debris present in the pasture was removed. Two weeks later, Sarah’s primary veterinarian, Dr. Smith came out for a recheck appointment and removed the sutures. Cash’s eye was healing without any complications. In 2 to 3 months, Sarah was advised to schedule a recheck appointment for her veterinarian to recheck the uveitis in Cash’s right eye. 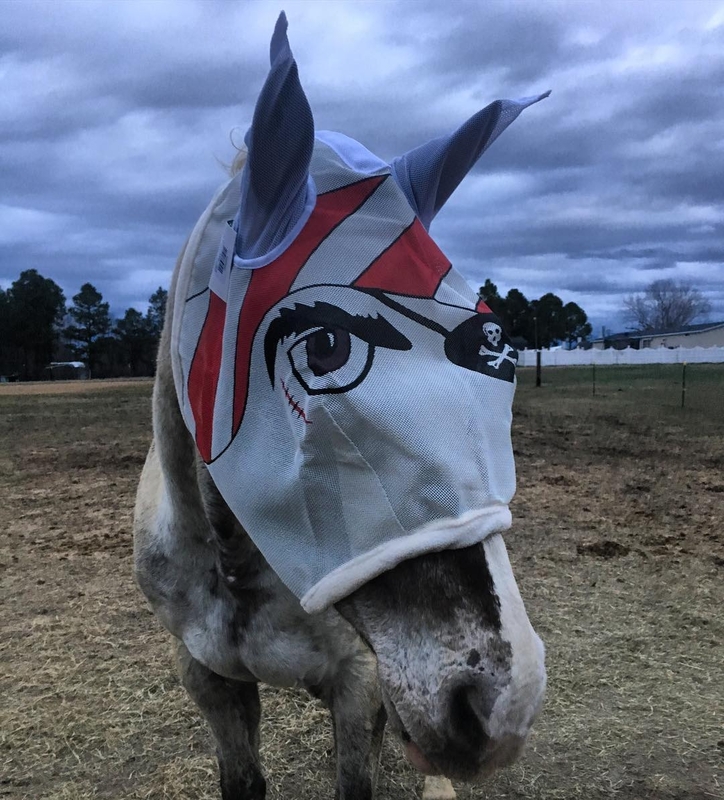 Sarah keeps a fly mask on Cash at all times while he is turned out in the pasture, to help reduce the risk of flies bothering his eyes and causing secondary infections or trigger for another uveitis episode. Cash is happy to be back out with his friend in the pasture and is adjusting well to the changes in vision. Follow Sarah and Cash on Instagram @mssarahcaitlin! 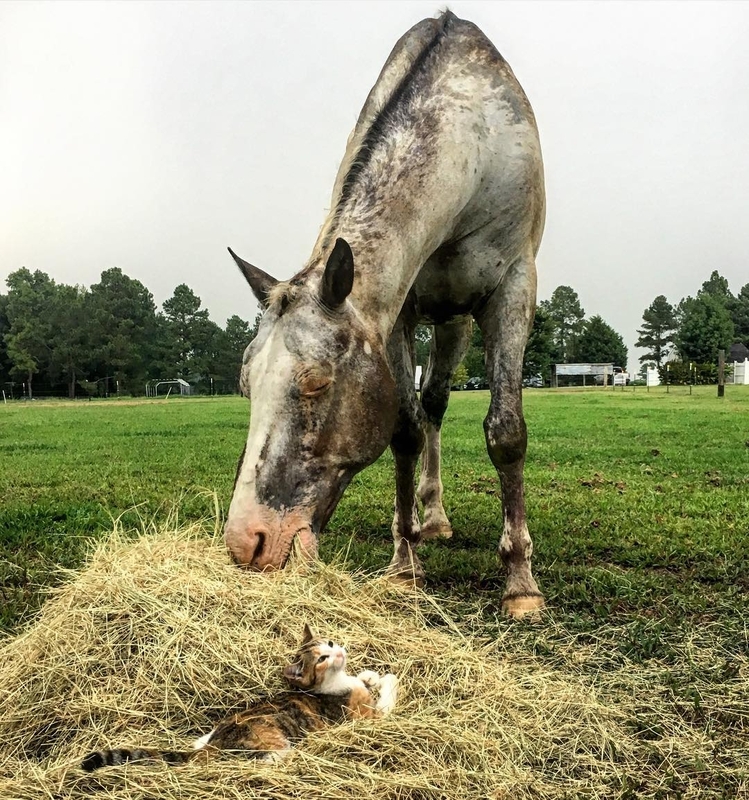 The North Carolina State University (NCSU) Veterinary Hospital is an integrated health care center for companion, equine and farm animals. 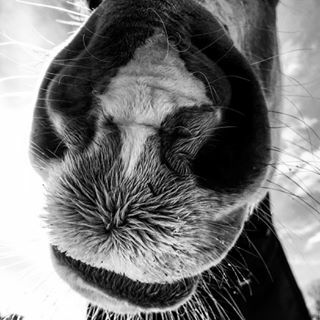 We exist to further the teaching mission of the NC State College of Veterinary Medicine and to provide state-of-the-art patient care. More than 20,000 patients are diagnosed and treated annually by the Veterinary Hospital.